One of the absolute most fun parts of decorating or redecorating for me is choosing lighting. I can’t have enough light fixtures and lamps. If I had taller ceilings in my house I would have a chandelier in every room. as it is I push the envelope every time and squeeze in a chandelier here and there where it is not meant to to be. I am very aware of all tall men in my life. Because – I always have to warn them not to hit their heads in my ceiling lamps, lanterns, chandeliers etc.. Here is some inspiration on my favorite lights, lanterns, chandeliers and pendants for the fixer upper farmhouse look. Now this metal cage style chandelier, lantern is from Currey and Company so it is on the higher priced end but there are look alikes that you can get for less money. I love the airy, simple traditional feel of this light. Notice how large it is in the space. It follows the motto – “Go big or go home”. Well you are home so go big. A tiny light would have so much less presence. However the fact that it is open makes it feel uncrowded. Here are some lantern style chandeliers that give you a similar look, some are lower priced. Try them over your kitchen sink, dining table, island or peninsula or any hallway. Here is the Fitzjames lantern used in a living room. Some of the latests styles of wood and metal chandeliers for dining rooms are so refreshing. They have the style of a formal chandelier but are metal with rustic wood s and metals with geometrics shapes that are surprising and new. They definitely become the highlight of any room. My daughter and son in law’s condo was transformed by the wood chandelier that hey hung up over the dining table. It helped to identify the dining room part of the open space and set the style of the whole room. When they sold the condo (in four days), we used the picture of the greatroom which focused on the chandelier as the primary picture on zillow.com It stood out from all of the other lisitngs and the profile was saved over and over in those first few days. Emily and Brooke’s condo was transformed by this chandelier. Emily and brooke’s condo photos were very popular on Zillow and helped to sell the condo in four days. 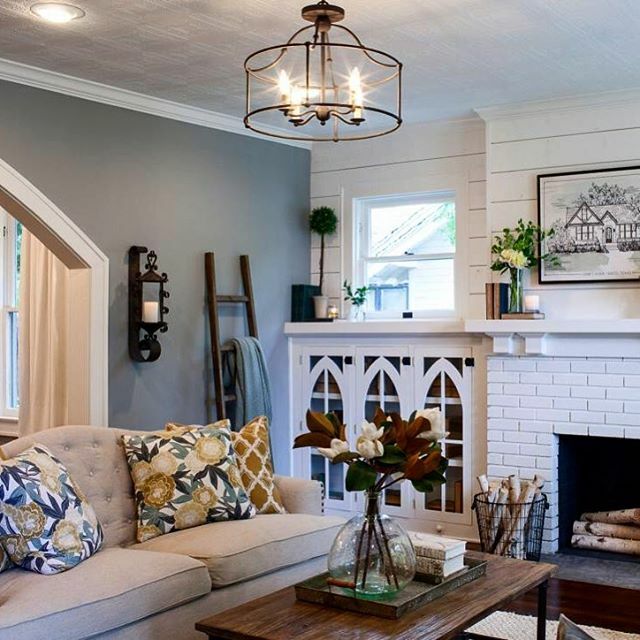 This wood geometric chandelier like on fixer upper helped to draw attention to the place. Here are some other gorgeous lights for the fixer upper look. Imagine this 8 light chandelier over top of a large island. Here are alternatives for less money. This chandelier with the unique electric tapers over the iron globe is especially suited for this round dining room. Fantastic lanterns with rounded glass globes for kitchen island but could be for so many other uses. This lantern here has a great price at $199. It is fairly large so it has a really good presence. Hi Janice, I love this blog! The pictures are great and thanks for including the sources. I simply love these light fixtures! They all look so stylish! I’m already saving a few here to check them out later. Thank you for sharing them!